My good luck with Irish weather is unbelievable. Most days have been sunny and fairly warm. 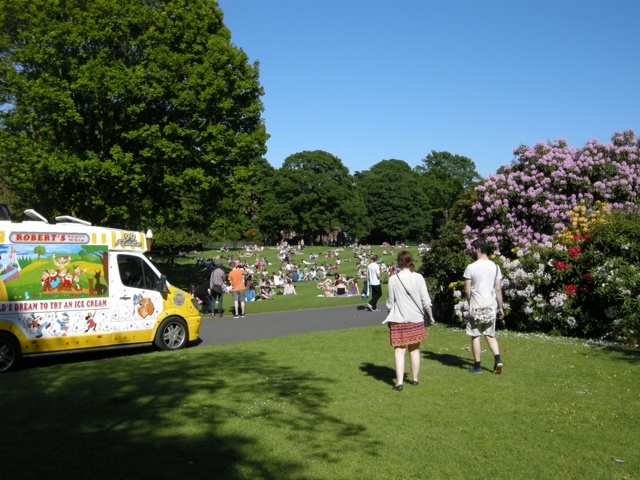 The Irish flock to bask in the warm rays as though they believe it will be the only sunny day the whole summer. By mid-afternoon, most will be bright red with the rare Irish sunburn. Not wanting to miss out on any of the great weather I tagged along with some Aussies planning on wandering about the botanic gardens. We explored several greenhouses and the temperature/humidity definitely made us even more appreciative of the perfect Irish summer we’d been experiencing. I couldn’t even take any pictures of the interesting plants and critters because the camera lens would immediately begin to fog up! Eventually we came across the Ulster Museum and were enticed by the free admission and AC. It proved to be quite the diverse museum with history on the bottom floors, art on the top, and nature in the middle. We took a bit too long wandering about the history sections, which is very easy to do considering the vast and often troubled past of Northern Ireland (and Ireland as a whole). We didn’t even make it to the art sections, and had only minutes to power though my obviously preferred topic. The nature area was full of taxidermy animals and skeletons, but one exhibit, quite literally, stood above the rest. I remember being wowed by the story of the “Irish Elk” when first learning about it during an undergraduate course. Even its common name is a misnomer, as it is neither exclusively Irish nor an elk species. In fact, it is often also referred to as a Giant Deer. This species is among the largest deer to have ever existed. They could reach nearly 7 ft (2.1 m) at only the shoulder and boasted antlers that could span 12 ft (3.65 m) from tip to tip! For comparison, while moose bulls could reach that shoulder height, their antlers would only span about 5 ft (1.5 m). However, the Irish Elk/Giant Deer is fascinating for more than simply its impressive size. 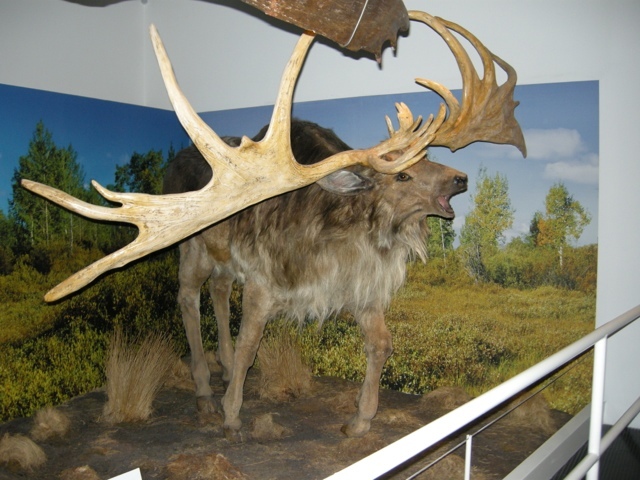 The massive antlers are often used as a possible example of a maladaptation, or a trait that becomes more harmful then helpful. Sure, antlers of that size would be undeniably irresistible to the lady Giant Deer, but can you imagine carrying them around all the time? I can’t even walk a few meters with my pack on without accidentally bumping into someone with my tent. If it was mounted on my head and 6 times the width, I wouldn’t be a very popular traveler. Several theories have been proposed on how such a great antler size was achieved. Perhaps very strong, constant sexual selection due to being used in combat with other males lead to their massive stature. Stephen Jay Gould, notable American evolutionary biologist, demonstrated that allometry (the relationship of body size to anatomy, physiology, and behavior) would predict that any deer of such a size would have that size of antlers, and they would likely be maintained by sexual selection, rather than caused by it. The cause for extinction is also a point of contention. Many other prehistoric megafauna went extinct from humans hunting them for food. However, the enormous size of the antlers is hard to ignore when considering reasons for this species’ demise. After the end of the last glacial period in Europe, climate change caused the vegetation to change, as well. 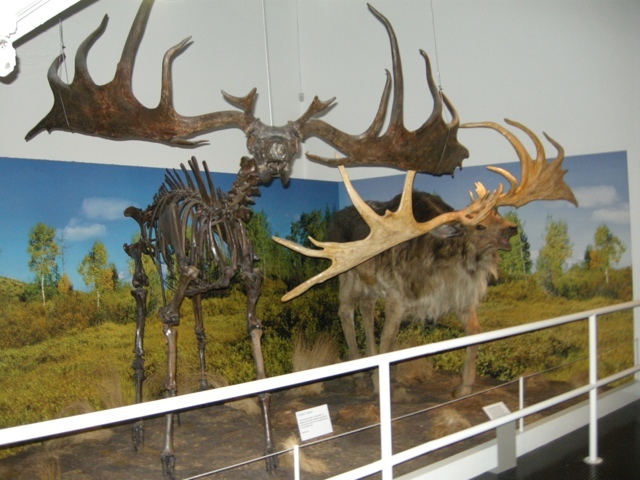 It is possible that the Irish Elk populations were unable to acquire sufficient amounts of nutrients and minerals required to sustain their great sizes. It is also possible that as landscapes changed to be more forested that the antler size would truly be a maladaptation, hindering the deer from moving about their ranges. During a time when we often hear about the current climate change and its harmful effects on different taxonomic groups its important to remember that even gradual, natural climate change can impact things. Can you think of any other examples of maladaptations, either in the past or possible ones for the future?